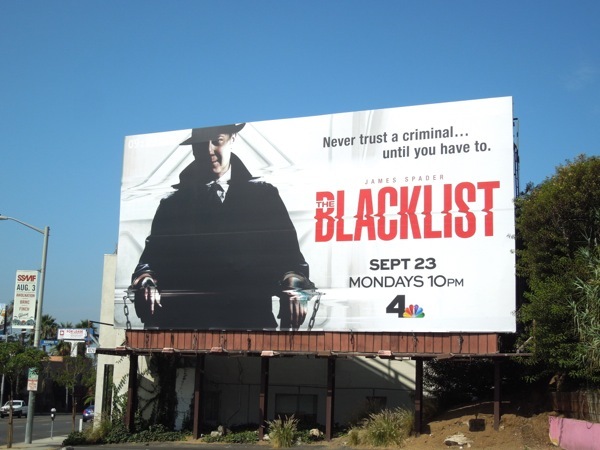 When Daily Billboard first glimpsed this billboard for NBC's new crime thriller, The Blacklist, the first thing that came to mind was that Fringe was coming back and this was one of the futuristic 'Observers' from that awesome sci-fi TV series. 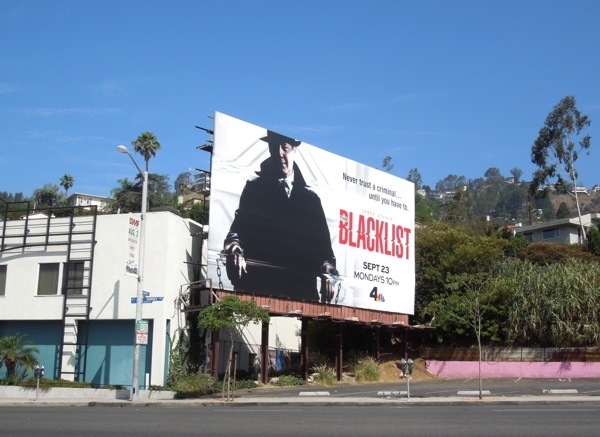 Instead it's actually James Spader all in black and hat, doing his best Observer impression as an international criminal mastermind 'Red Reddington' aka 'The Concierge of Crime'. 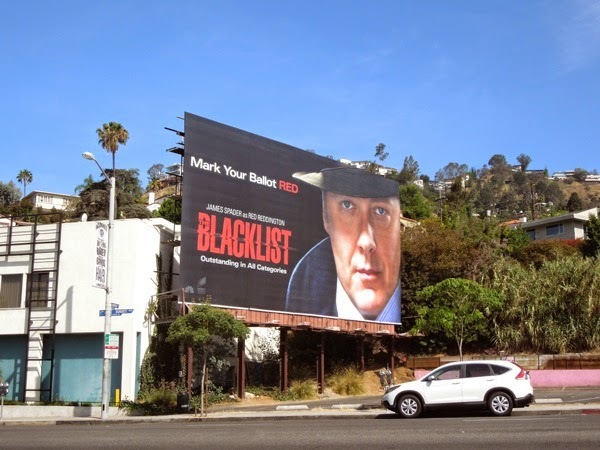 Ex-goverment agent 'Raymond "Red" Reddington' has been one of the FBI's most wanted for decades and has a reputation for brokering shadowy deals across the globe, that is, until he mysteriously surrenders to the Bureau. 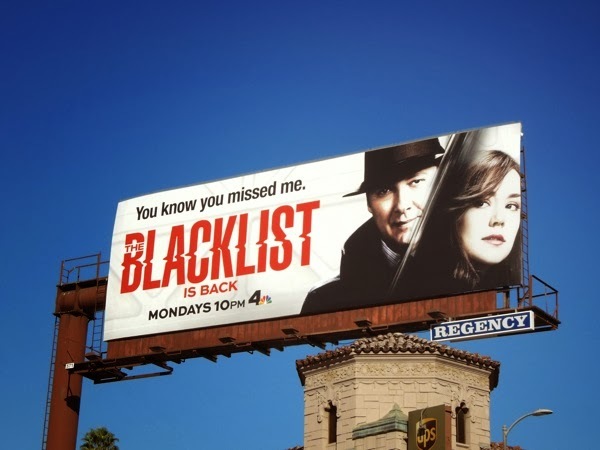 He'll help the agency catch a notorious terrorist long-thought-dead, but only if he speaks directly to a female FBI profiler fresh out of Quantico, 'Elizabeth "Liz" Keen' (played by Megan Boone) - it all sounds very much like The Silence of the Lambs, doesn't it. 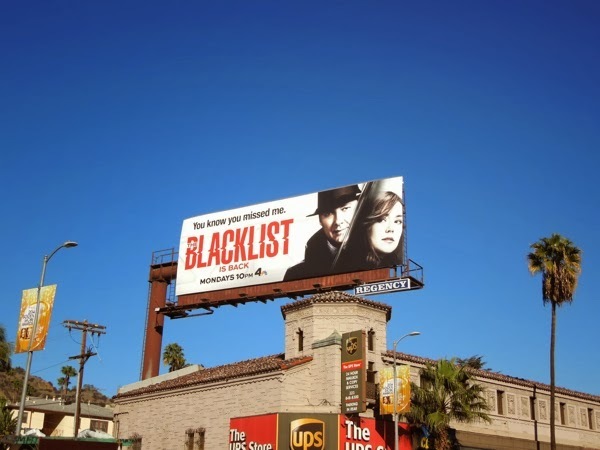 Why has he chosen this fledgling agent, what's their connection and is she hiding secrets of her own? 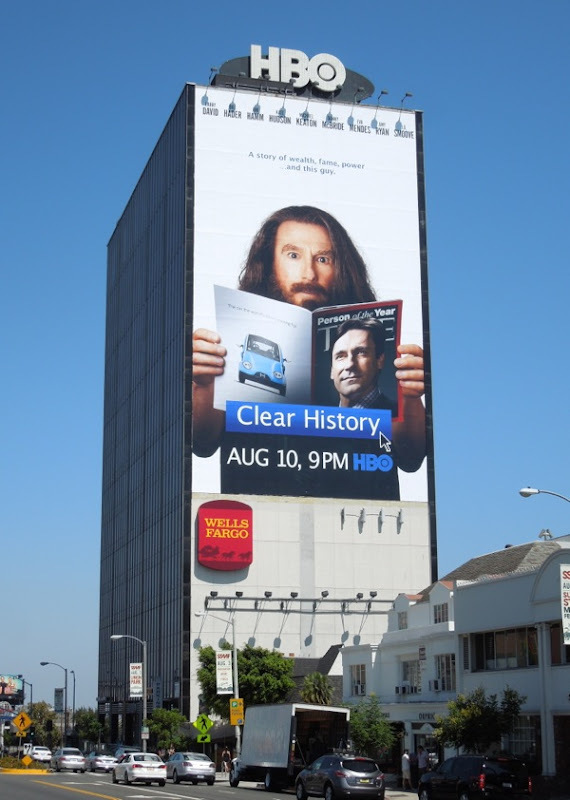 More importantly who else is on his 'blacklist' of criminals, mobsters, dirty politicians and spies, and why is he willing to give them up? 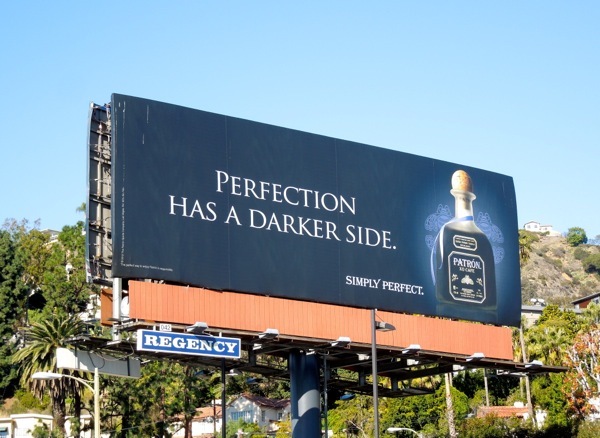 Is it all about revenge, or is Red up to something even more deadly and mysterious. 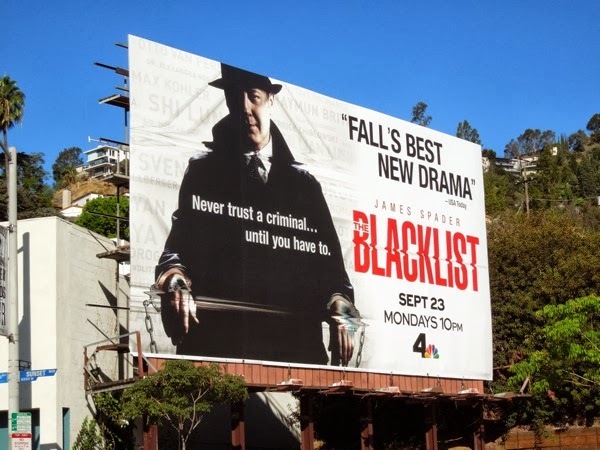 The new series sounds like an interesting premise, but we've recently seen criminals being formulaically ticked off a list episode after episode in the first season of The CW's Arrow, so let's hope The Blacklist isn't simply a mix of lots of other people's ideas we've seen before. 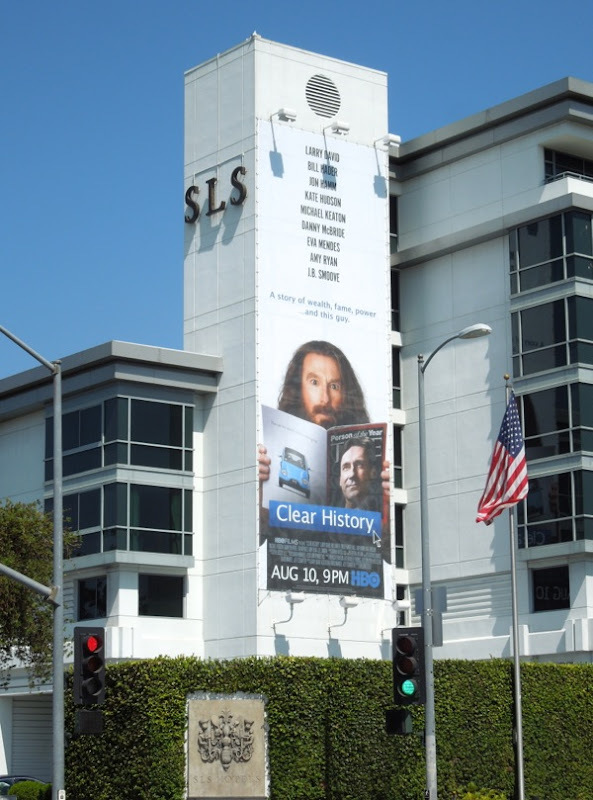 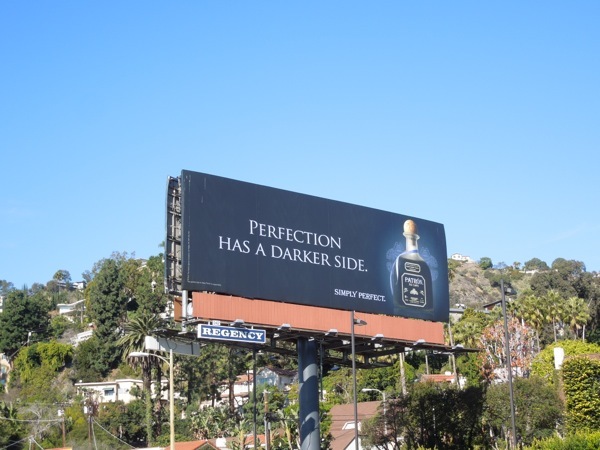 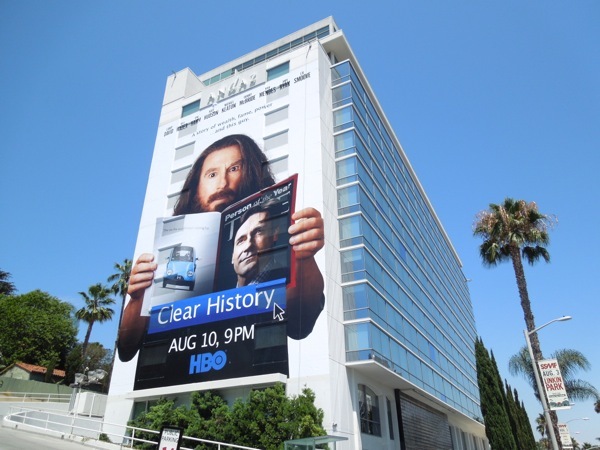 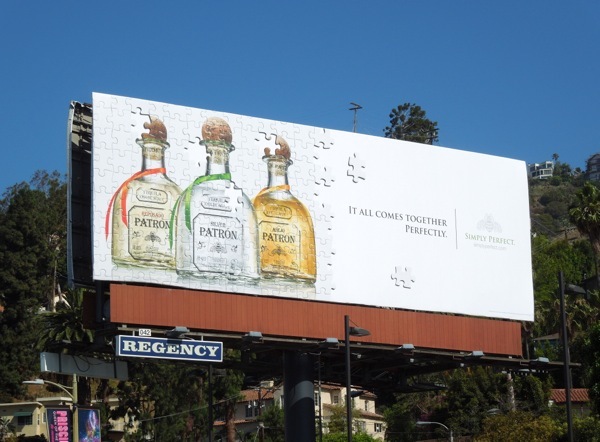 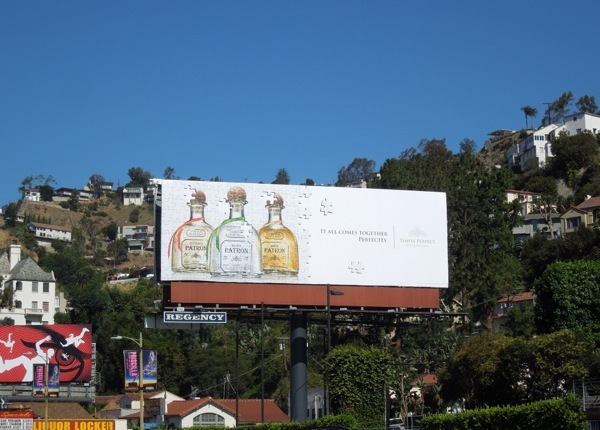 This enigmatic series premiere billboard was spied along Sunset Boulevard on July 13, 2013 and it certainly piqued Daily Billboard's interest. 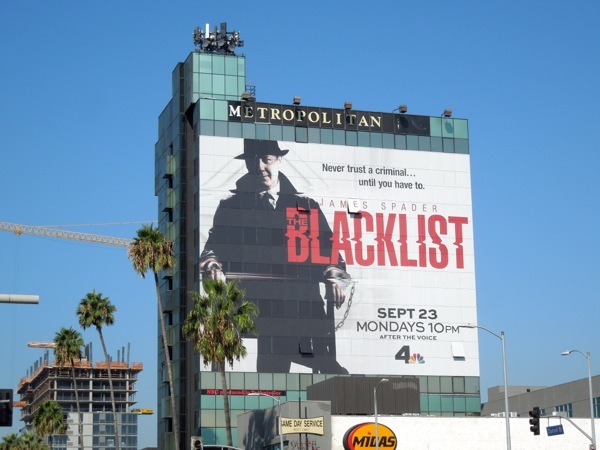 UPDATED: This creative for The Blacklist was probably the first to appear for the new fall season shows way back in July, but this super-sized billboard spied along Sunset Boulevard on the side of the Metropolitan Hotel Hollywood on September 12, 2013 is a big reminder for people to watch the new series. 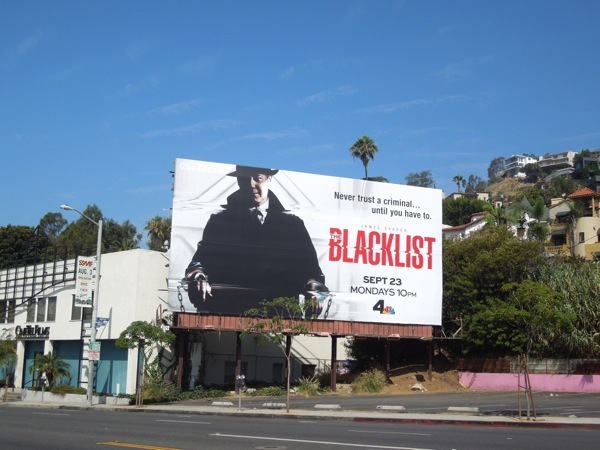 In addition to giant billboards promoting the series launch, another bit of PR worthy news is that James Spader has been cast as the major villain 'Ultron' in the blockbuster Marvel movie sequel, The Avengers: Age of Ultron, so that can only be positive attention for his new NBC series. 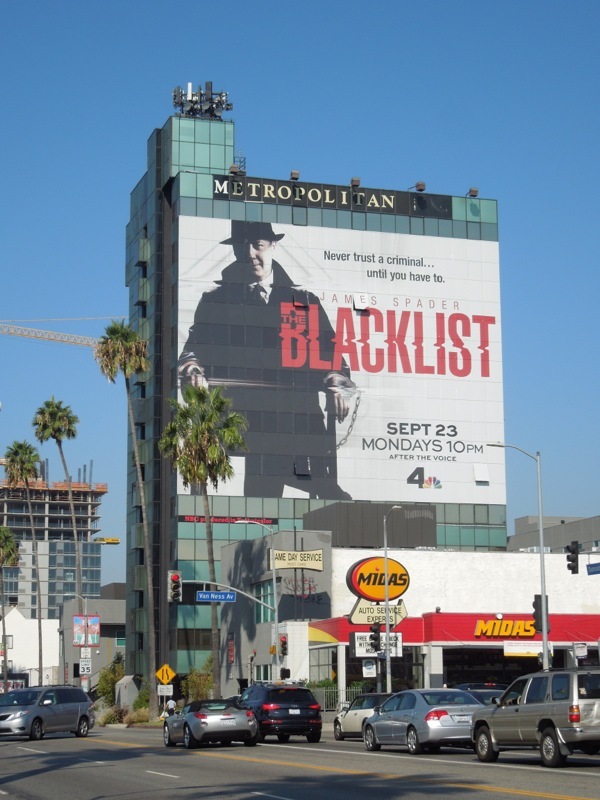 UPDATED: The Blacklist is proving to be quite an an entertaining new show and Daily Billboard isn't the only one who agrees, as the rookie series gets an updated creative with the tagline 'Fall's best new drama', snapped on October 5, 2013 in the same Sunset Strip ad location it's occupied since mid-July this year. 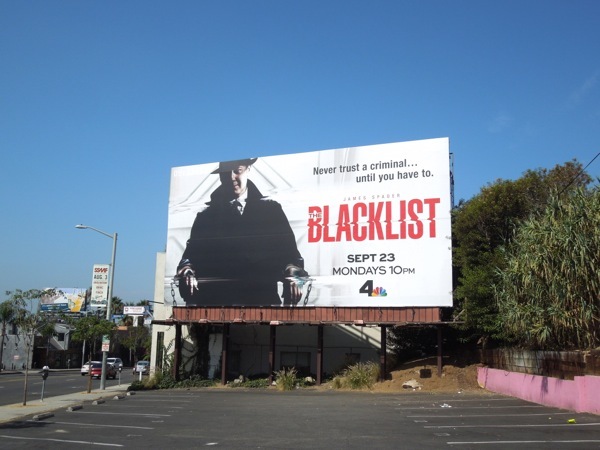 UPDATED: James Spader may not have won the Golden Globe he was nominated for for The Blacklist, but NBC obviously still want to support their popular new thriller with this winter premiere billboard which sees Megan Boone's 'Liz' share the spotlight with 'Red'. 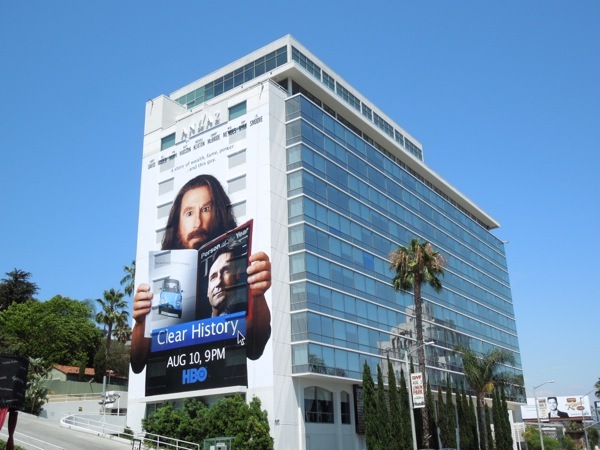 This playful 'You know you missed me' midseason billboard for the freshman series was spied along Sunset Boulevard on January 13, 2014. 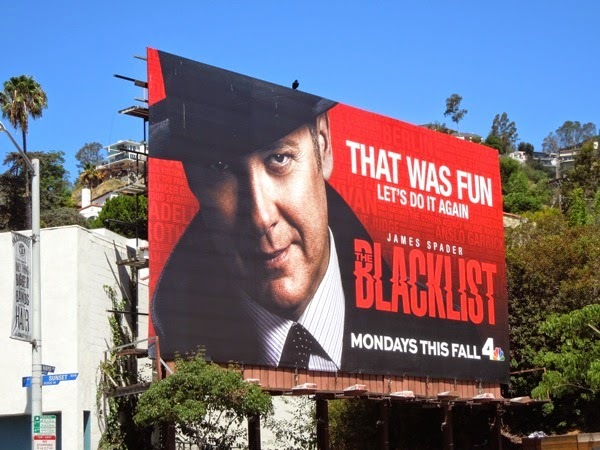 UPDATED: The Blacklist has been one of NBC's surprising success stories, so it's no wonder they'd like to garner some award accolades for the show and for James Spader as the enigmatic 'Red Reddington'. 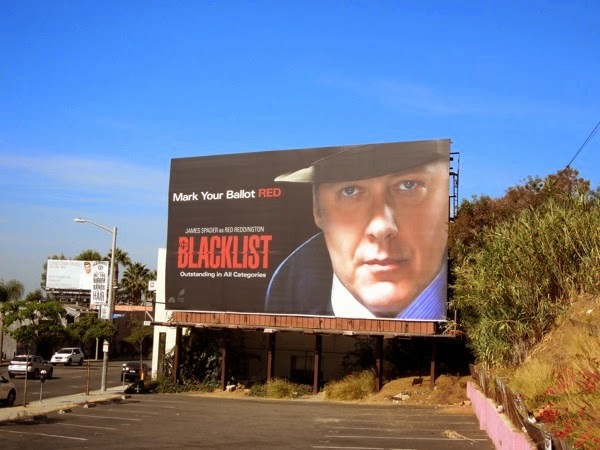 Here's the 2014 Emmy Consideration billboard spied along L.A.'s Sunset Strip on June 21, 2014 with the clever play on words, 'Mark your ballot Red'. 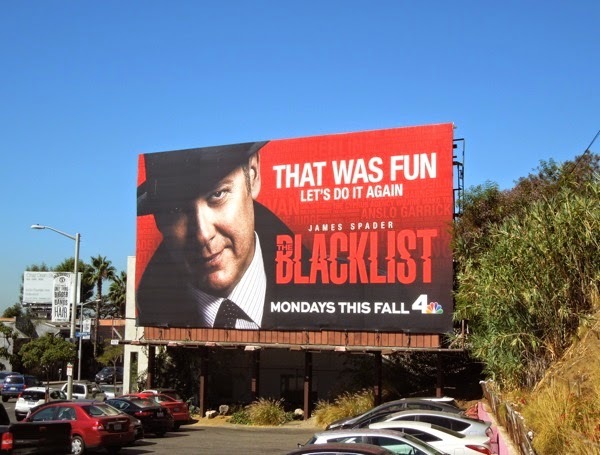 UPDATED: To get fans excited for the second season of The Blacklist, this sophomore season 'That was fun, let's do it again' teaser billboard replaced the Emmy version and was spotted on July 23, 2014. 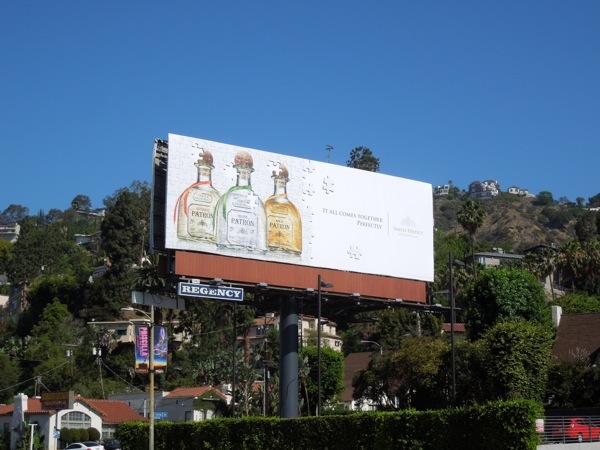 The Sunset Strip is L.A.'s infamous mile-and-a-half stretch of Sunset Boulevard in West Hollywood, renowned the world over for its decades long rock and roll music history and influence (plus for its concentration of vibrant, eye-catching billboard ads of all shapes and sizes). 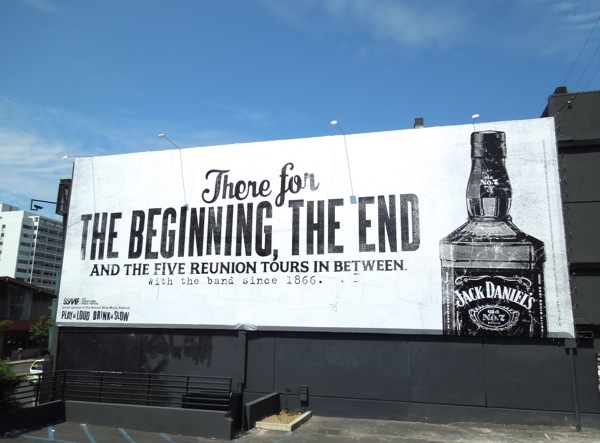 A mecca for musicians, rock bands and their admirers, the Strip is home to such legendary venues as Whisky A Go-Go, The Roxy Theatre, the Rainbow Bar and Grill and The Viper Room. 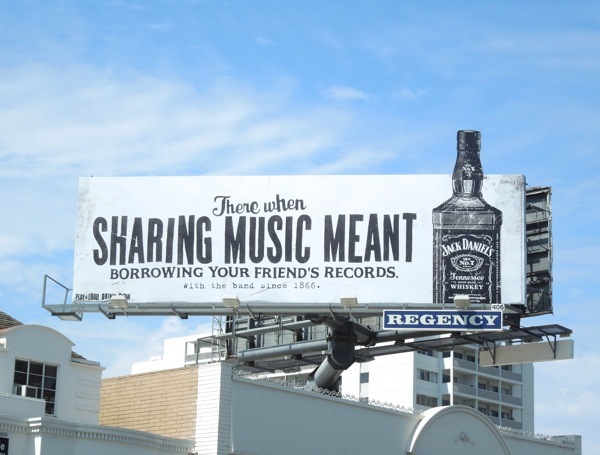 It's no wonder then that an alcoholic drinks brand like the world's best-selling American whiskey, Jack Daniel's, would want to associate itself with the cool and edgy perception of this rock and roll lifestyle. 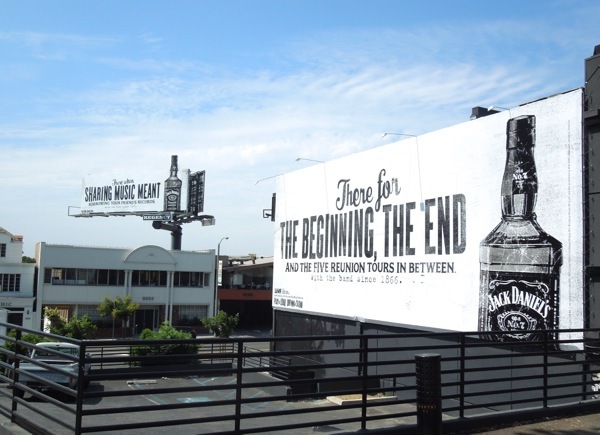 Over the past few years living close to the Sunset Strip, Daily Billboard has witnessed first hand the strong synergy between the Tennessee whiskey and the notorious location. 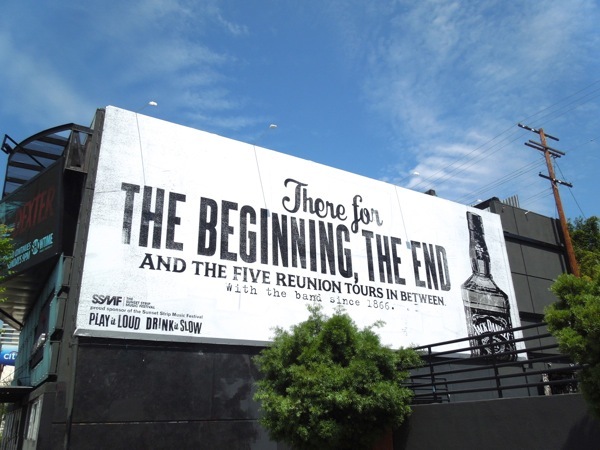 This latest batch of black and white billboard creatives certainly reinforce the whiskey brand's association with the music industry as a whole, plus highlights their participation as one of the major sponsors of the annual Sunset Strip Music Festival. 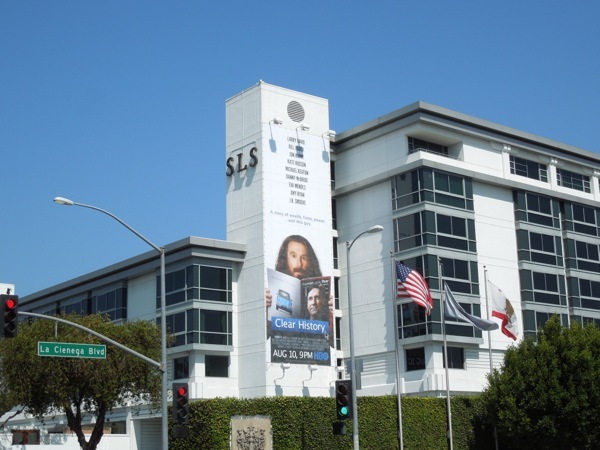 This year the festival culminates in a big street fest on August 3, 2013, with bands and recording artists like Linkin Park, Wale and Awolnation headlining. 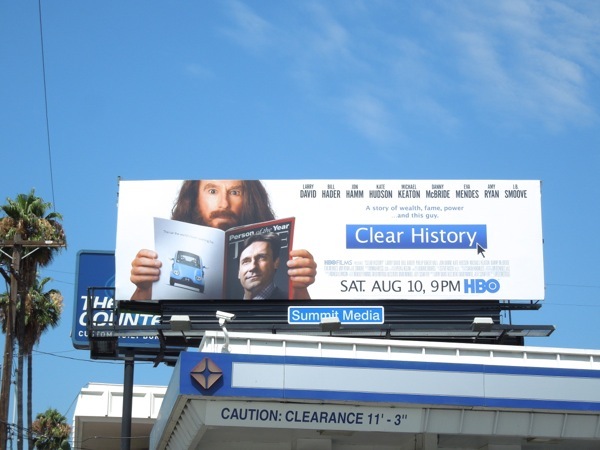 This duo of billboards on either side of the street, including a cool special extension billboard for extra stand out, were photographed on July 22, with the 'There for the beginning, the end' ad snapped on the side of the now closed Key Club venue. 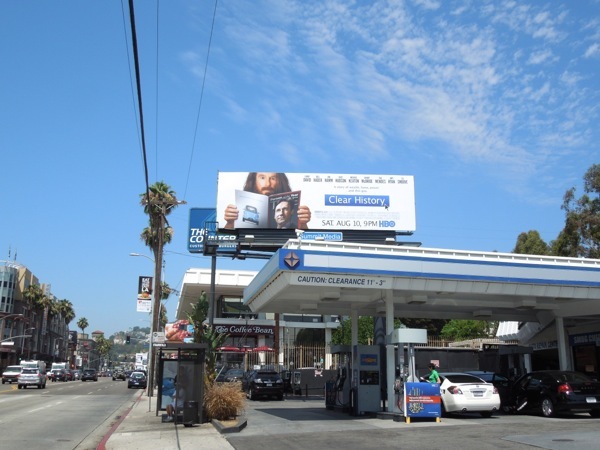 Both vinyl visions will be highly visible during the Sunset Strip Music Festival in these locations (and what is it with this fascination with billboards for the same brands, movies of TV shoes on either side of the street lately, like this cool billboard duo for The Bridge?). 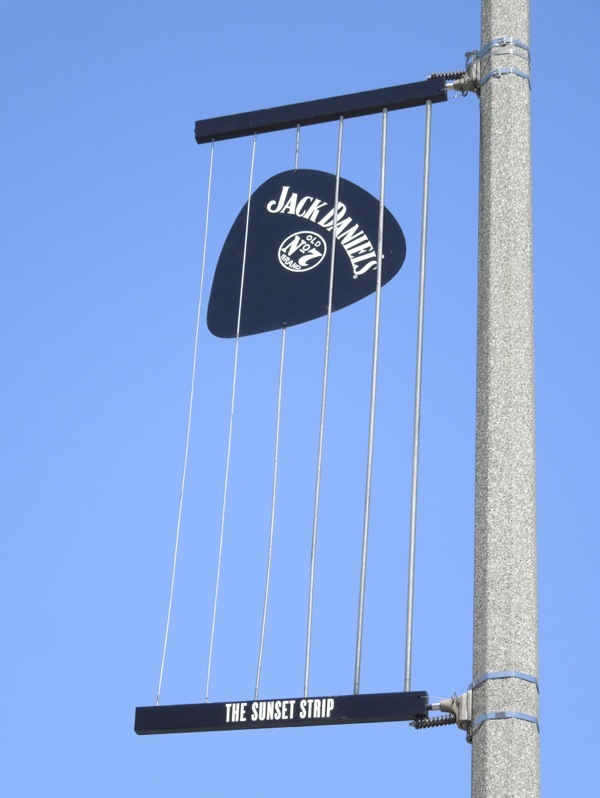 Meanwhile, earlier this year in May 2013 Jack Daniel's took over all the street lampposts along the Strip with this clever ad campaign, including this ingenious branded guitar pick installation, further emphasising their musical credentials. 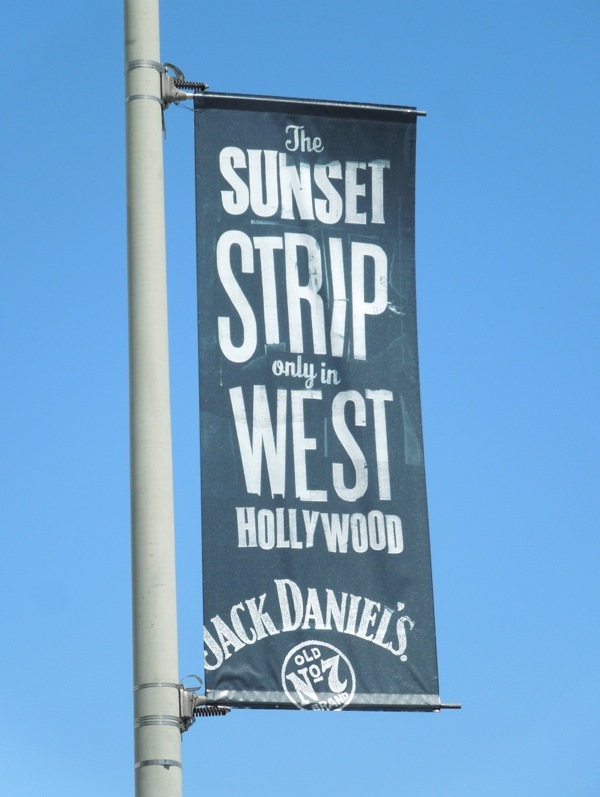 Be sure to take a look at more of these fun and irreverent Jack Daniel's Sunset Strip banner ads that lined the street's skies in May. 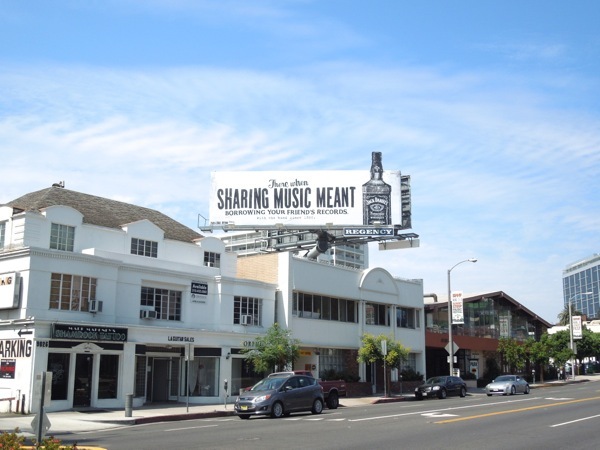 In addition to all this advertising, Jack Daniel's has also been involved with the Sunset Strip's GuitarTown public art installation, which has seen for the past several years giant 10ft Gibson Les Paul fiberglass guitars invade this stretch of West Hollywood, each individually designed by artists as tributes to musicians, bands and rock legends, all to be auctioned off to help charity. 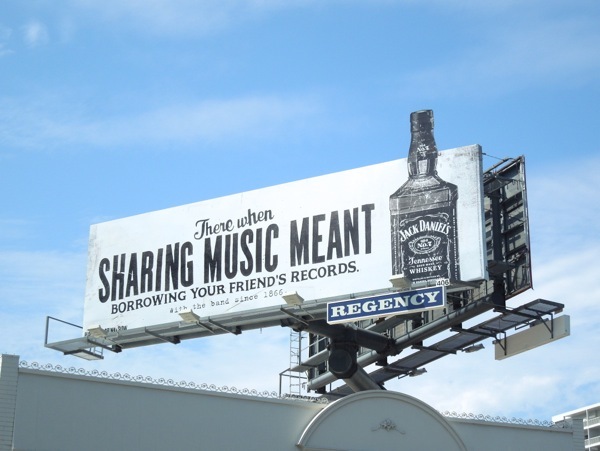 Be sure to check out the previous Jack Daniel's guitar sculpture creation from 2010 and the 2012 guitar homage to photographer Jim Marshall. 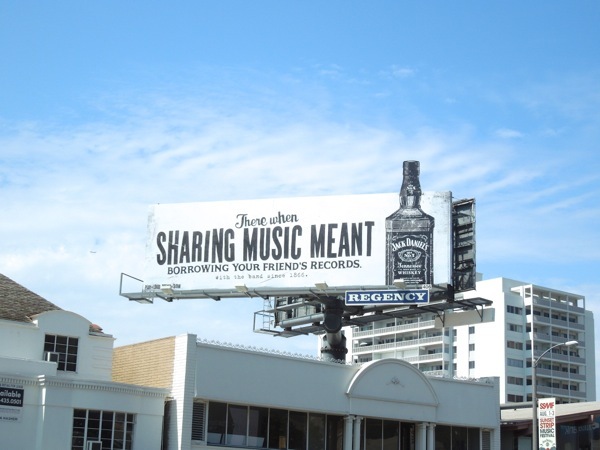 If you're a fan of special extension ads like Daily Billboard is, you'll also want to take a look at this billboard for Jack Daniel's Whiskey and Cola variant from May 2011. 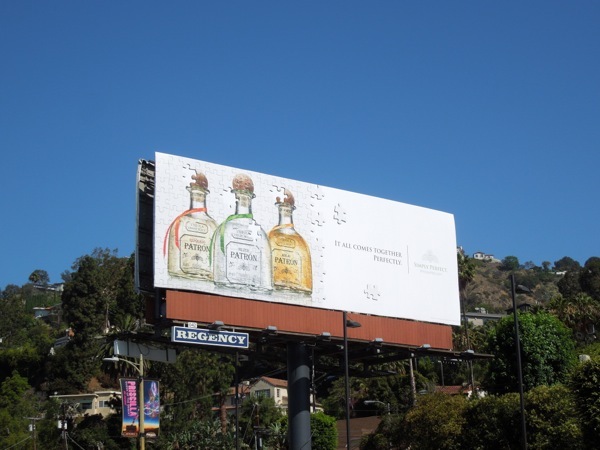 Be sure to enjoy your next sip of whiskey (responsibly) and have fun at the festival if you're able to attend. 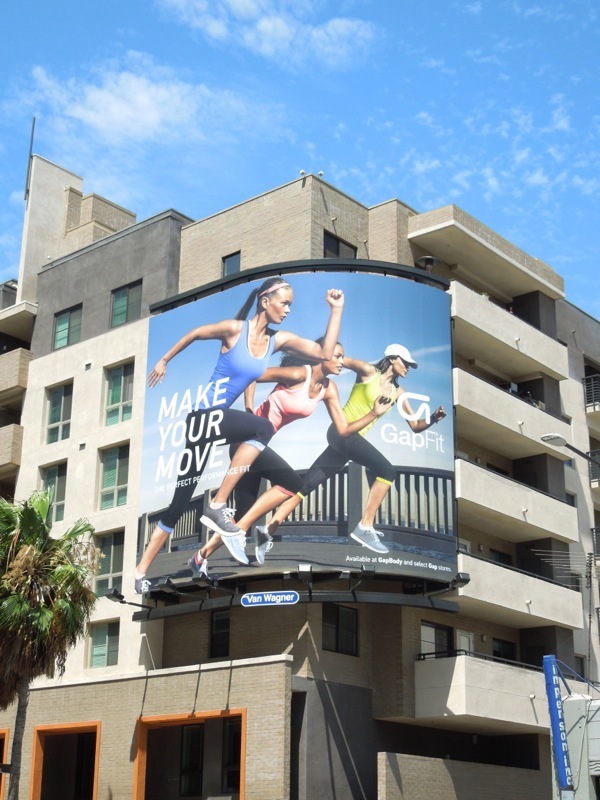 On your marks, set, shop. 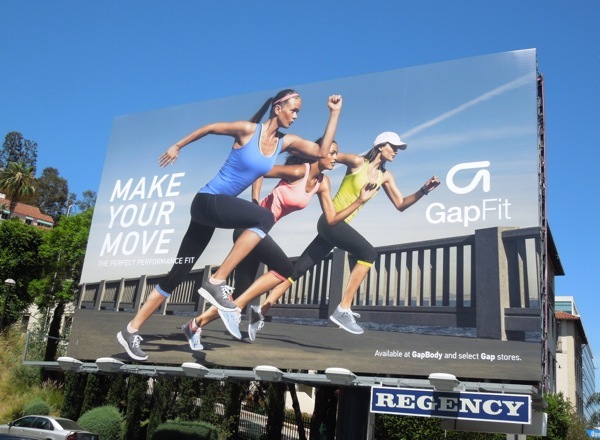 From the looks of these latest creatives from Gap for their women's activewear range, Gap Fit, they are still giving Nike and Lululemon a run for their money. 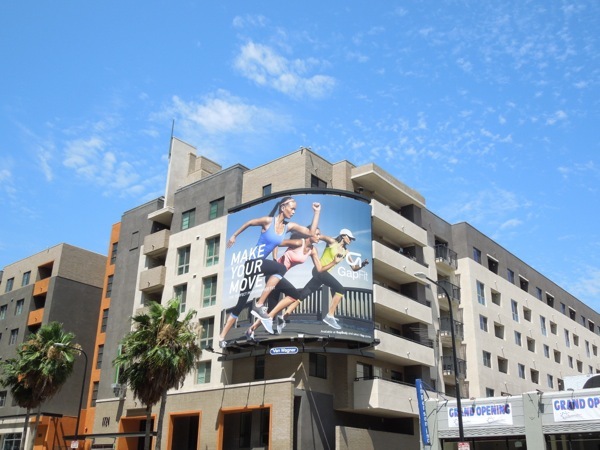 These exercise clothes for running, dancing, working out, yoga or just plain relaxing, certainly look the part, and these vibrant and active billboards certainly stand out in the skies of L.A., compared to similar more passive fashion advertising. 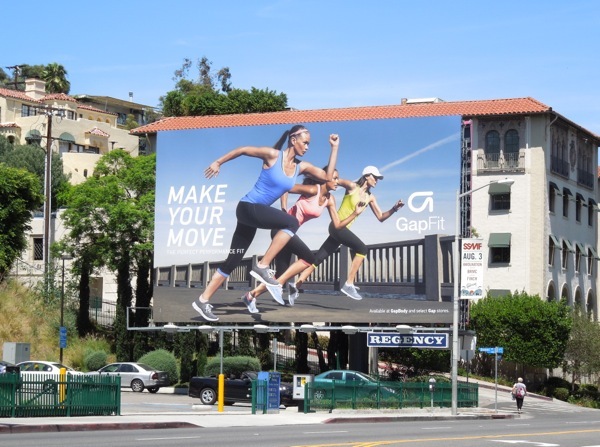 These sporty Gap Fit billboards were snapped at Hollywood & Highland, plus along Sunset Boulevard on July 10, 2013. 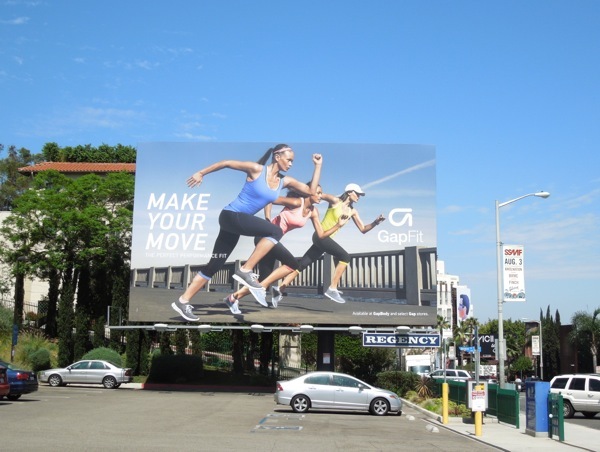 If you like these Make Your Move ads, be sure to also take a look at the previous Gap Fit ad campaign from 2012. 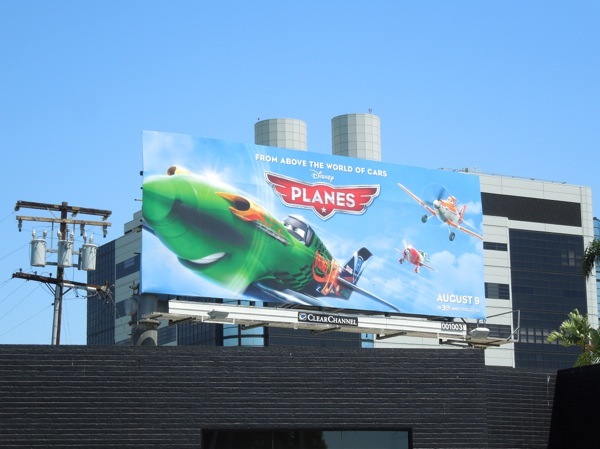 Daily Billboard may be dating ourselves, but it's hard not to look at this giant billboard for Disney's new Planes animated movie and not think of the 1987 John Hughes comedy starring John Candy and Steve Martin - Planes, Trains And Automobiles. 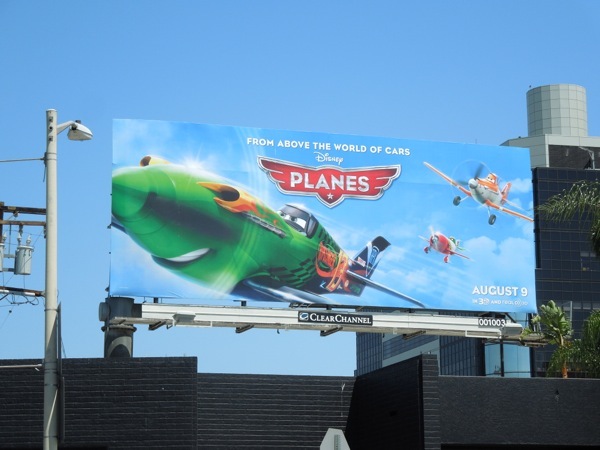 First there was Disney/Pixar's Cars in 2006 (followed by a not so successful sequel in 2011) and now it's time to experience the world above 'Lightning McQueen' and his Radiator Springs pals. 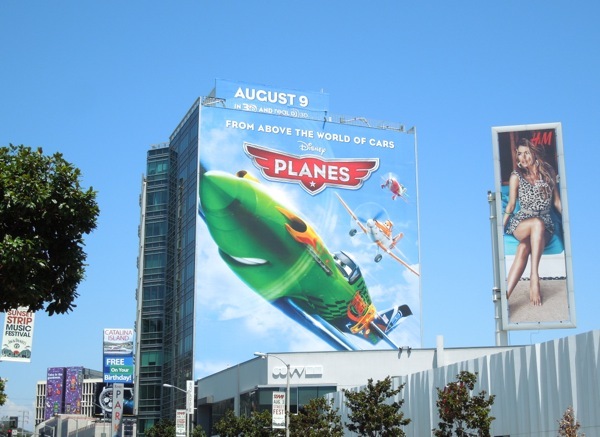 Now there's planes, so how long do you think it'll be before we see trains (although hasn't Thomas the Tank Engine got that genre covered), or even ships? 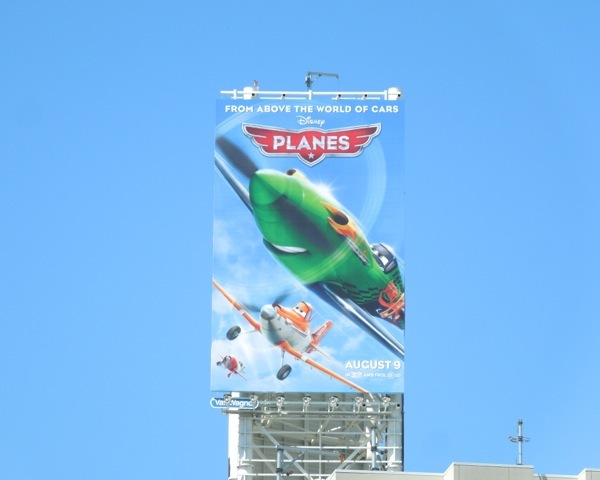 Interestingly this spin-off focusing on the talking aircraft is from DisneyToon Studios and not Pixar (although since Cars director John Lasseter is Chief Creative Officer of both Pixar and Walt Disney Animation Studios you can probably stop your fretting), plus this computer-animated adventure was originally set to be a direct-to-video release, but will now take its first solo flight theatrically. 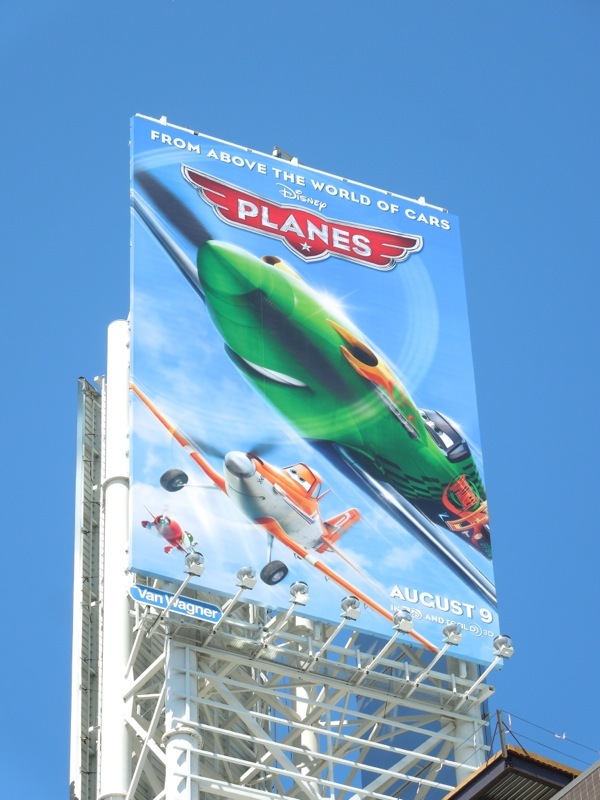 The story focuses on a small-town crop-duster called 'Dusty' who wants to be a high-flying racer. 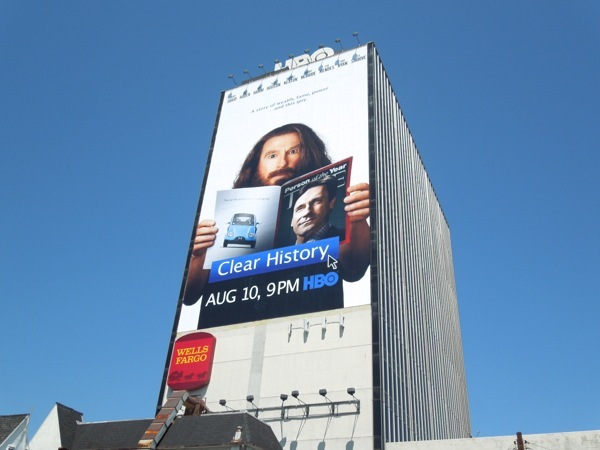 There's only a couple of problems, he's not built for it and he's hopelessly afraid of heights. 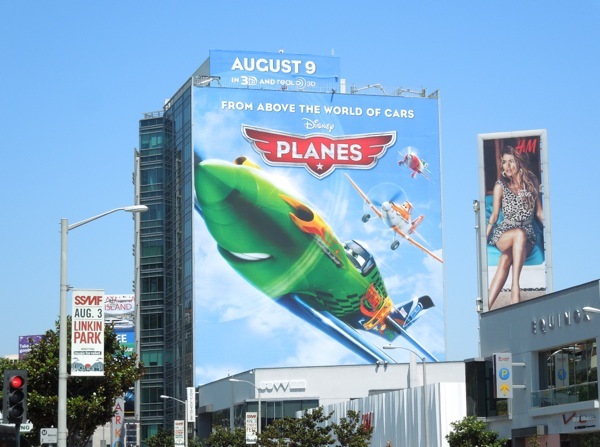 Fortunately in true Disney fashion, with the support of seasoned aviator 'Skipper Riley' and a whole host of new aeronautical friends, he's able to rise to new heights and soar to success. 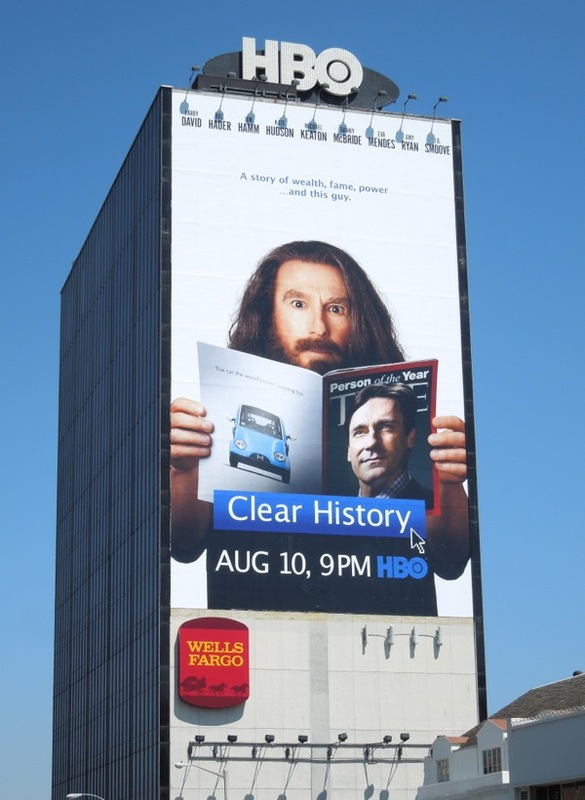 These fun billboards for Planes were spied in the skies of L.A. on July 23, 2013, including this super-sized version along the busy Sunset Strip. 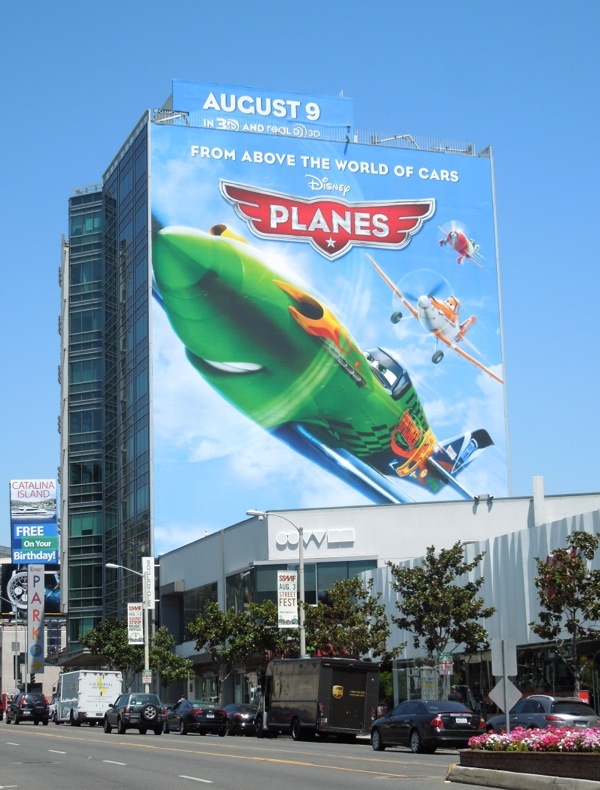 Cars proved to be a huge commercial and merchandising success for the world's largest media conglomerate (in revenue terms) and it even spawned its own Cars Land at Disneyland in California, so Daily Billboard is sure Disney hopes to replicate this success with their latest animated offering. 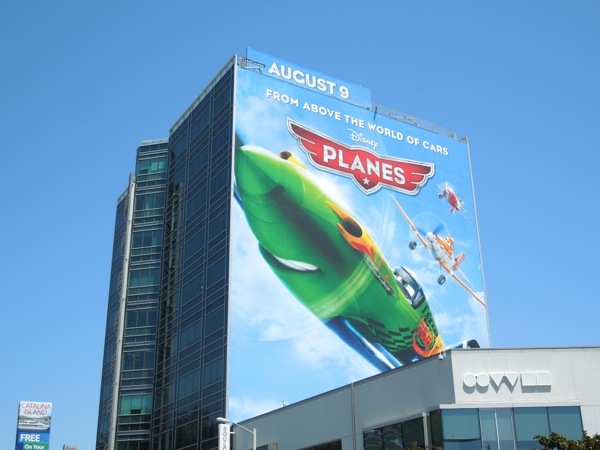 If you like this giant eye-catching ad for Planes, be sure to also check out this super-sized Cars 2 movie billboard in the same location from May 2011. 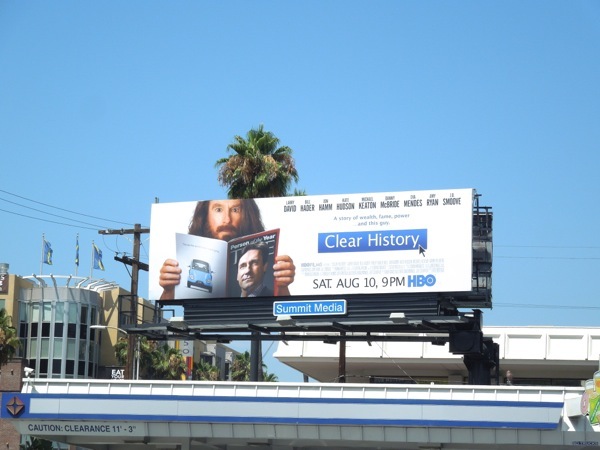 UPDATED: Here's another billboard format for the Disney movie, high over Sunset & Vine in Hollywood on July 29, 2013. 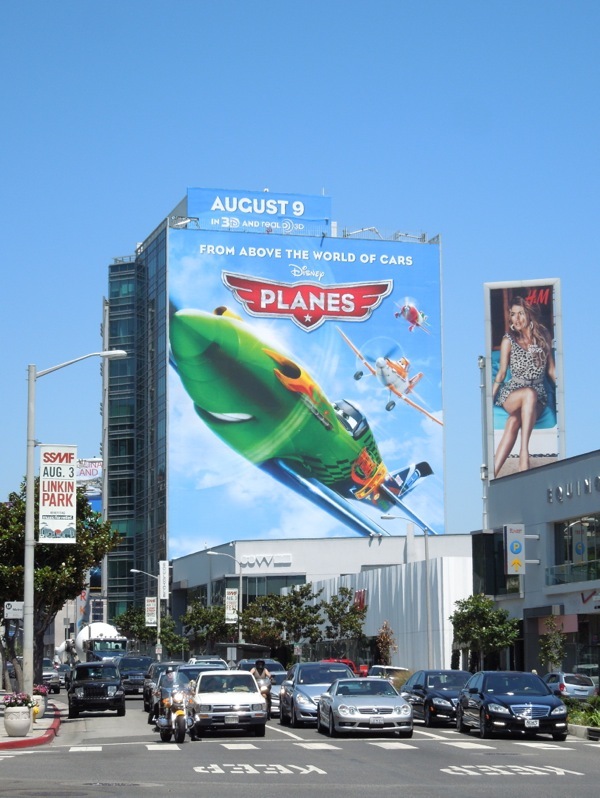 Imagine how much more impactful this ad would be if the green plane was a special extension billboard, it would be like it was flying through the air up that high.